Located in the Capitol Hill historic district in downtown Salt Lake City this contemporary design provides a live work space for a local photographer. The eclectic nature of the immediate context on Vine Street provided challenges with regards to scale, massing, and privacy. The overall framework of Capitol Hill contains primarily 19th century single family residential, whereas, Vine Street was redeveloped in the mid-20th century to contain a mix of historic homes and high rise condominiums and apartments. Balancing the need for separation from the street and large glazing to welcome the favorable southern exposure, two horizontal geometrically matched volumes were created to contain the domestic functions and one large vertical volume was created to contain the parking and photo studio elements. 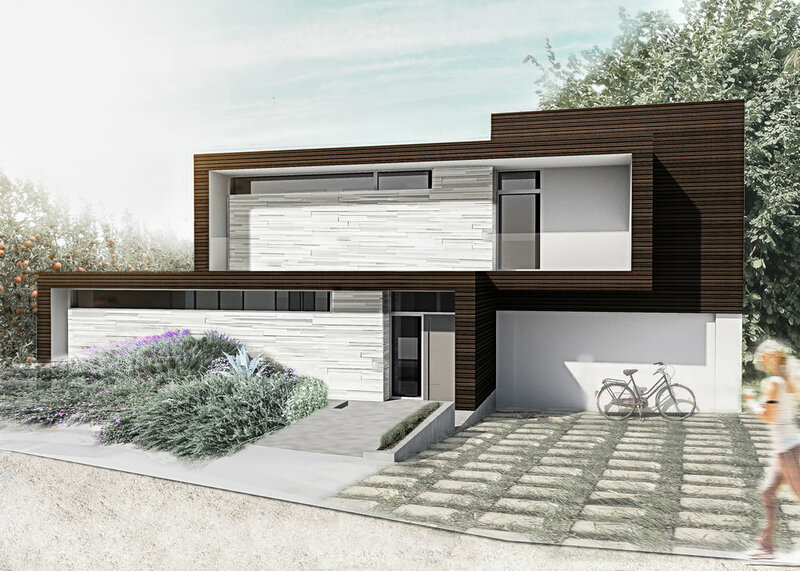 The domestic geometry extends from the street elevation where it creates a recessed porch to the back patio of the home creating recessed overhangs for sun control. The upper domestic volume extends over the front of the vertical 26’ high photo studio and garage mass bringing a sense of human scale to the street façade. Metal fabricated screens were created as vertical green walls that further reinforce the sense of privacy and provide an impression of retreat and solitude in the urban context. These screens are situated to reflect the program behind and extend vertically to create the railings for the upper deck patios defined by the domestic geometry.